Boxing should be taught in prisons in England and Wales in an effort to improve discipline and boost education, an independent expert has said. A report for the Ministry of Justice said ministers should consider allowing combat sports – with the current ban a “missed opportunity” to cut offending. 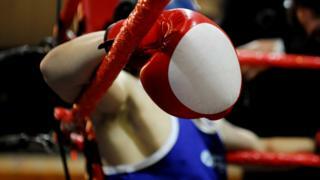 The author, Professor Rosie Meek, said boxing was already taking place “illicitly” but could be used for good. The MoJ said it had “no plans” to allow boxing or martial arts in prisons. In a report, which was commissioned by the MoJ, Professor Meek reviewed the current provision of sport in prisons, young offenders’ institutions and secure children’s homes. She said her research found “some really exciting work going on in prisons”. However, the psychologist and prison researcher said it was not widespread and there were “missed opportunities for using sport in efforts to reduce reoffending”. She said “professional staff” from across the secure estate – alongside male and female prisoners – had expressed frustration that boxing-related programmes were not offered in prison. Currently, there is a blanket ban on all martial arts and boxing in prisons in England and Wales. Prof Meek said boxing programmes offered at some secure children’s homes and secure training centres were “well received and highly valued” for behaviour management. She called on the government to “re-consider” its policy and pilot the introduction of “targeted programmes which draw on boxing exercises, qualifications and associated activities”. Although the government accepted some of Prof Meek’s findings, it refused to reassess its blanket ban on martial arts in prison. A statement from the Ministry of Justice said: “Our priority must be the safety and security of the custodial environment and the wellbeing of staff, participants and other prisoners. Last month, the Observer newspaper reported that former justice minister Philip Lee – who commissioned the report – accused the government of “cowardice” following claims a cabinet member told colleagues to dismiss the findings. Prof Meek told the BBC: “I was disappointed that there’s currently a blanket ban in public sector prisons on any martial art-related activities. She added that in community settings, children vulnerable to involvement in gang violence and drug use “have responded really well to [boxing]”.